i love, love, love the sweet and heat that happens when fruit and chiles meet. and since chiles are on the menu for this month’s tigress can jam, they simply had to go the way of sweet and heat as far as i’m concerned. we don’t grow hatch chiles in austin, or even texas for that matter. they can only be grown in a place called hatch, new mexico. think of it like true champagne which only comes from…well, the champagne region of france. otherwise it’s contraband champagne, otherwise known as, sparkling wine. but we have adopted the hatch chile as one of our own here in texas. we just love chiles! but we do grow ourselves some apples here in texas, which may surprise you. 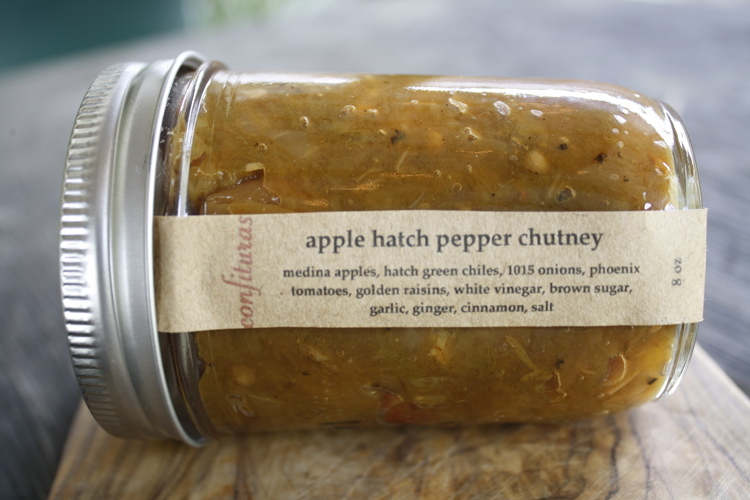 this chutney is made from the cameo variety picked in medina, texas at love creek orchards. i came up with this recipe with influences from so many sources i couldn’t even begin to give credit where it’s due. i guess that means it’s mine now. and dude, you have to have this with a big chunk of excellent aged cheddar or a thick cut pork chop if you’re so inclined. put all ingredients in a big ol’ pot and simmer, reducing liquid and softening fruits and veggies until desired consistency. there’s really no wrong way to this, folks. place in sterilized jars and water bath process for 15 minutes. Do you know I’ve never had a hatch chile? It’s a serious failing in my life. Regardless, I’m sure this is delectable: it looks so like a salsa verde, no? But with apples…. mmmmm. the brown sugar and apples take the salsa tones out of it–it is very fresh and clean tasting unlike many other chutneys i’ve tried, which i find rather ‘muddy’. you need to try hatch–i will send you some next year! Yum! Fruit and chiles are fabulous! I miss the roasted chiles from the roadside in Colorado where I used to live. They would be excellent in this! i’m sure they’re the same chiles–sounds perfect! This sounds so good and I love that you picked the apples at Love Creek. I took my kids there a few weekends ago for their annual pumpkin patch. What a great place! Thanks for another awesome recipe with a Texas twist. How is business? thanks, lisa–business is going like gangbusters. having a hard time keeping up, but i always said it would be a good problem to have! you’re welcome-so glad you enjoyed!